Dr. Grady and his staff are great! The level of care is excellent. They are so prompt I don't know why they bother to have magazines in the waiting room." Drop up us an email and let us know when you can come in for your free consultation. Of all the methods available today for changing and improving the look of your smile, veneers are among the most popular and successful with our patients. 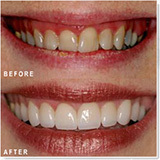 The process involves removing a small amount of tooth structure to make room for the veneers. The dental lab then fabricates the veneers from impressions. After placement, the veneers look like natural teeth. Some advantages of porcelain veneers over bonding include increased longevity, and resistance to staining. Full mouth makeover involves restoring the teeth, bite, muscles and self-esteem back to a natural looking and youthful feeling condition. Using computerized technology and an artistic eye, full mouth restoration may be the answer to many problems, such as heat-sensitive teeth, sore jaw muscles, and recurring headaches. 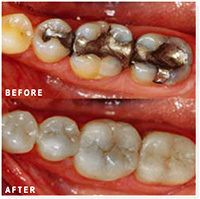 Many restorations are fabricated using a metal lining covered with porcelain. These types of crowns are used because they are cheap and easy to place in the mouth. They are opaque or flat looking because they do not let light pass through as natural tooth does. There is often a dark or gray line next to the gum line. We provide exclusively all porcelain-bonded restorations. When properly placed, they are strong, if not stronger than the porcelain-covered metal crowns. Notice the appearance of natural teeth again. Metal-free dentistry can restore your full dentition back to natural form and beauty. Teeth whitening or bleaching is one of the most popular areas of cosmetic dentistry. Even subtle changes in shading can make someone look years younger. Several factors can contribute to the darkening of teeth, including the effects of age, certain foods and drinks, smoking, and medications. Until recently, dental patients have been told that repairing teeth with white fillings was just for cosmetic purposes, and white fillings may not be as durable as the metal restorations. This philosophy is now passé. With modern technologies of dental adhesion, resins, lasers, and state-of-art ceramics, the new porcelain restorations are close to rivaling nature in strength, wear, function, and appearance. There are now 16 year studies showing that with properly administered techniques, these advanced restorations surpass traditional dentistry. With these new materials, it is possible to bond teeth together, virtually restoring them back to their virgin strength without the invasiveness of full coverage crowns. In the majority of circumstances, metal fillings or crowns can be replaced with techniques that are more conservative. It is therefore possible to preserve the remaining healthy tooth structure rather than whittling teeth down, much like a pencil would be ground away by a pencil sharpener. Smile Design is a conservative, nonaggressive procedure to rejuvenate your smile. Veneers work well for tooth reshaping and resizing. Veneers are an attractive way to improve your smile because they achieve a very natural look with a very conservative tooth preparation (shaping). Very little natural tooth structure is removed when veneers are bonded into place and the virgin strength of the tooth is recaptured as well. 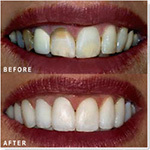 We have found that this is the treatment of choice for smile enhancement if more than whitening is needed.